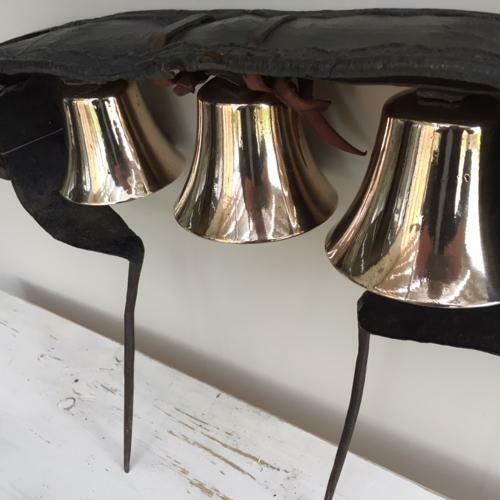 Stunning set of 19th Cent Horse Team Bells on original canopy with iron fittings. This set is comprised of 3 large Latten bells of top quality brass as you can see from the pics. Each has its' original clapper and all bells ring true. These bells were fixed to the horse's back pad or collar when working in the fields in teams. It allowed the farmer to hear that they were still working from far away! They were also useful if pulling a heavily laden cart down a country lane or farm track. It would be very difficult for the horse to reverse so you wanted everyone to know that you were coming and to make way. Team Bells are rare to find and in such nice condition. The look good mounted onto a block of oak etc.